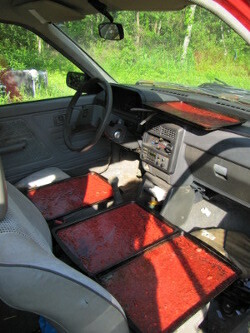 I've been having a lot of fun drying strawberry leather in an old car (22 cups of strawberry leather preserved for winter feasts! ), but there are clear downsides to the method. Deanna DeLong summarized the pros and cons of several different methods of drying as follows. Oven drying. You can simply put your food on cookie sheets (or on cheese-cloth-covered oven racks), turn the oven on very low, crack the door, and dry food that way. But oven drying takes two to three times as long as dehydrator drying (which means fewer nutrients and less flavor survives the process) and you use a lot more electricity. You need to move the food around often since the air flow isn't very regular, and you often end up with areas that overheat and turn brittle. I think that oven drying's primary use is as a backup to solar drying --- if you have food nearly dry and suddenly the weather turns rainy, you can finish it off in the oven. Sun-drying. The simplest dehydration method is to put your food on cookie sheets or screens in a sunny spot, covering them with netting to keep off bugs. Although easy, sun-drying is really only appropriate for climates with high heat (highs in the 90s or above for extended periods), low humidity, and low air pollution. If you can get away with it (mostly in the southwest if you live in the U.S.), sun-drying is the cheapest method and the UV light kills some microorganisms in your food. On the other hand, sun-drying can take ten times as long as dehydrator drying (which means fewer nutrients left at the end), and cloudy or rainy days can ruin your food. 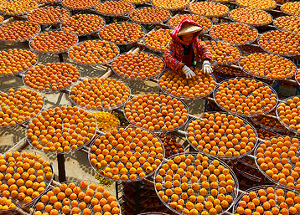 Even in hot climates, sun-drying is only appropriate for fruit, and you need to be prepared to poke at the drying produce two or three times a day. Drying in a warm room. A few foods can be successfully dried in a warm room. These include herbs and nuts in the shell. Be sure to set up a fan to move moisture-laden air off the drying food. Solar dehydrator. 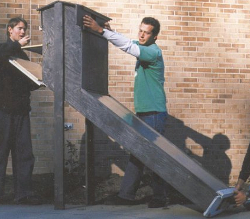 A solar dehydrator like the one we dream of building can elevate air temperature by 20 to 30 degrees Fahrenheit, so you can get away with drying food in more temperate climates, even if you have high humidity. You're still at the mercy of the weather and food must be rotated, but solar dehydrators will dry food faster than sun-drying, so the food is more nutritious. Electric dehydrator. 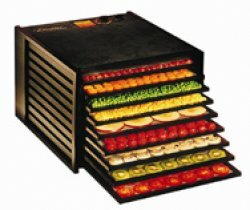 A good electric dehydrator has a thermostatically controlled heating unit and a fan, so food is dried as fast as possible (meaning maximum flavor and nutrients.) Top of the line units heat very evenly, too, so they're set-it-and-forget-it, and many even come with a timer. After doing the math on how much it would cost me to buy enough cookie sheets to dry our excess fruit in our very variable climate using the sun, I decided to go ahead and buy an electric dehydrator. More on the model we chose once it arrives and we give it a test run. Solar/electric hybrid dehydrator. You can get the best of both worlds (low energy usage and fast, nutritious food) by building a solar/electric hybrid. The solar collector heats the food on sunny days, while the thermostatically controlled heating unit kicks on when it's cloudy and at night. A fan keeps air flow more uniform. I dream of turning our electric dehydrator into a hybrid unit, but Mark wants to spend a bit more time learning how a standalone solar dehydator works first. Our 99 cent ebook helps you find time for homesteading. Green beans, corn, sliced peppers, etc. used to be strung around the room and dried that way. The beans were called "leatherbritches." By lowering the pressure you can literally make water boil at room temperature. You might not want to go that deep because of the agitation, but you could evaporate water very quickly without heating the food. That's definitely a unique way of drying food --- I'm pretty sure I've never run across anyone talking about vacuum dehydration of food before! A quick search of the internet suggests that vacuum dehydration is used for purifying oil, though. Daddy --- Not sure how I overlooked your comment until now. It was a hectic day yesterday with the interview! What did you think of the flavor of those various dried foods? Freeze drying can be done with or without vacuum.